Enjoy your February Taco Talk! P.S. There’s still time to order for the big game this Sunday (but not much--what are you waiting for?). Melissa, our lovely catering specialist, is standing by, ready to take last minute orders. Just call 1-855-225-8678 and tell her Pam sent you. And as I do every year at this time, I'd like to share with you my keen, completely biased observations on the differences between how men act when they're in a Cal Tort and how women act when they're in a Cal Tort. Ready? A woman will never look at the Wall of Flame and wonder what it would be like to drink it all. A woman will rarely stand up in the middle of the restaurant and rub her belly when she's done with her burrito. A man will rarely pull his Burrito Elito card out of his bra. So come on in Valentine’s Day and woo your sweetie with a free treat! Who doesn’t like it when their date doesn’t spend money on them on Valentine’s Day? *What's this delicious thing called? Our Facebook fans have offered hundreds of suggestions and we have narrowed it down to 5 choices. All you have to do is cast your vote here by February 5th and the person whose suggestion wins will receive free burritos for a year! And hopefully share them with you. 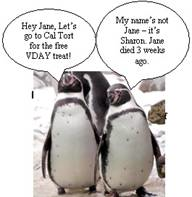 I know that I’ve used this cartoon before, but I had to use it again because I like everything about it: I like that the one penguin is excited about a non-fish Valentine’s Day treat, I like the thought of penguins eating at California Tortilla and I like that Sharon didn't find it necessary to tell the other penguin what her name was before holding flippers with him. The Bacon Chicken Club Burrito is back and it’s FLYING out the door! 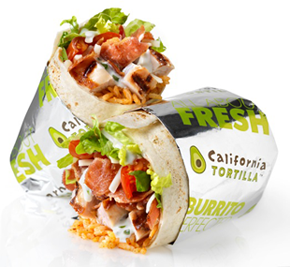 It’s got grilled chicken breast, Monterey Jack cheese, smoky hardwood bacon, Roma tomatoes, romaine lettuce and Mexican rice, all topped with jalapeno ranch and wrapped in a soft flour tortilla. So good. ON THAT NOTE, HAPPY VALENTINE'S DAY! If you have any questions about your Burrito Elito card, please e-mail [email protected]. *Catering, gift card, and point purchases are exempt from the Burrito Elito program.